This week's Next 20 community builder is Elspeth Nicholson. Elspeth knows children. She is a mother of three, has five grandkids and has worked in childcare for the last 30 years. She is the Executive Director of Pooh Corner Day Care which is uniquely located in Stanley Park and places an emphasis on learning through play. She is also passionate about the outdoors and started the meetup group BC Outdoor Adventures. What were your experiences like as a child? I grew up off the grid—we had no power, which meant no TV, and so we spent all our time outside. When I started elementary school I remember loving it as I finally got to meet other kids other than my twin brother. When I was nine, we moved to the Sunshine Coast and we lived in a town with a lot of people. My mother had a bookstore and so I had access to lots of information and I read like crazy. I started getting bored at school, as it didn't feel like what I was learning was relevant to life. I started getting into trouble and in Grade 8 I quit school. I had a job and was able to rent an apartment. I was financially independent at age 14! I know it is crazy especially when I think of 14-year-olds today, but it was different then, and I was a really grown up kid. It was only after I had three kids that I decided to go back to school and finish Grade 12 and then complete my Early Childhood Education certification. Everyone is so different, I have three kids, and the first two loved school. They did really well in it. They came home every day and did homework without being told. My youngest was a totally different story. She was diagnosed with ADHD, and school was a nightmare for her. The whole business of having to sit down and have information put into you just didn’t work for her, and it didn't work for me either. 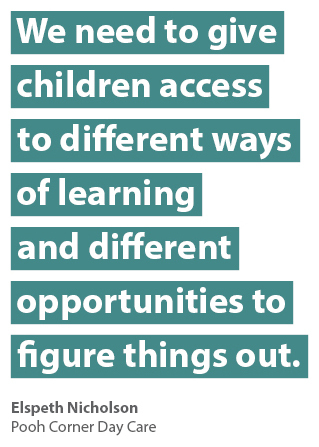 We need to give children access to different ways of learning and different opportunities to figure things out. Tell us about the philosophy at Pooh Corner Day Care. Our program is designed to gratify the natural curiosity inherent in all children so that they can develop their potential emotionally, physically, socially, creatively and intellectually. We believe in providing children with freedom to explore, to investigate, to take responsibility for their own actions and to make mistakes without the label of failure. Through this approach we hope that they will feel supported in their endeavours and build positive feelings towards themselves and their world. We are located in Stanley Park, and have an extensive outdoor playground beside Lost Lagoon, and place an emphasis on learning through play. How would you define creativity? We live in a society with a lot of rules and certainly there is value in having rules. In a daycare, rules are important to ensure the safety of children. But what happens when the rules don't work or aren’t enough? We need to be able to think differently when situations warrant it. We need to be able to adapt and change when needed. That is what creativity is all about — the ability to think differently. Maintaining an open and creative frame of mind is what helps me work through challenges. What does creativity look like in your personal/professional life? When I work, I like to make plans that focus on outcomes. It is easy to get stuck in the planning stage but you can't make a plan that will have all the answers. When plans go off the rails you need to know what to do. Having clear outcomes helps you maintain your focus and with creative thinking you can find different ways to get there. In my personal life, connecting with nature is what grounds me and nurtures my creativity. I get bored quickly with sameness and repetition. But sometimes you don't have a choice when you have children to care for and work commitments to meet. When my kids were 2, 4 and 6, I worked full time for 15 years and I was busy. When my kids left home I thought to myself, "Wow, do I ever have a lot of time if all I have to do is work." A few years ago I started a meetup group called BC Outdoor Adventures and now it has almost 5,000 members. We plan all kinds of cycling, backpacking, hiking, snowshoeing and camping adventures. This year, I’m going to cycle from Banff, Alberta to Eureka, Montana on a mountain bike. I love these adventures and need them as they help me feel like me. What promotes the development of creativity in young children? Giving children opportunities to show leadership and mentor others helps develop creativity. Just because we are big and they are little we are quick to assume that we know so much and they know very little but that isn't always true. At Pooh Corner we like to encourage older children to help younger children as much as possible. By stepping out of the way we allow children to practice self-regulation and the ability to negotiate through challenging situations independently. What inhibits the development of creativity in young children? Doing everything for children and not allowing room for choice definitely inhibits their creativity. Realistically it is hard and I get that as a busy parent it is easier sometimes to pick out your children's clothes, and tell them what they are going to have for breakfast and what they are going to do. Routine is good, so within a set routine, try to give children space to make some of their own choices. What advice can you offer for young people today? Nothing is permanent. If there is one thing you need to be able to deal with, it's change. How can we encourage leadership in young people?